Karl Hubbuch is probably most closely identified with the style that came to be known as Neue Sachlichket (New Objectivity). 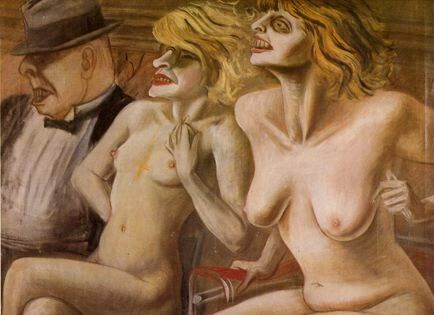 Less overtly political than colleagues such as George Grosz and Otto Dix, he perfected a neo-realist style that critiqued society through its blunt honesty. Hubbuch was born in Karlsruhe and attended the Academy there between 1908 and 1912. He subsequently studied at the School of the Museum of Applied Arts in Berlin under Emil Orlik at the same time that George Grosz was a student there. He volunteered for military service in 1914, and served as an artilleryman until 1918. In 1922, he studied again with Orlik, this time at the Prussian Academy of Fine Arts in Berlin. In 1924, Hubbuch began teaching lithography at the Karlsruhe Academy, which appointed him full professor in 1928. During the 1920s and early ‘30s, his work was included in numerous exhibitions, among them the 1925 Neue Sachlichkeit show in Mannheim and a group show, with Dix and Grosz, at the Galerie Neumann-Nierendorf in Berlin. Between 1935 and 1945, Hubbuch was forbidden to practice as an artist and earned occasional money by painting ceramics and cuckoo clocks. After the war, his appointment as professor at the Karlsruhe Academy was renewed, and he began to exhibit his work once again. In 1957, he retired from his professorship, but continued to be active, participating in numerous exhibitions throughout Europe in the 1960s and ‘70s. Hubbuch died in Karlsruhe.